Former Northern Ireland midfielder, Dean Shiels has been released from Derry City amid interest from Coleraine. DECLAN Devine has revealed midfielder, Dean Shiels has left the club by mutual consent, claiming the former Northern Ireland international didn’t fit into his plans. It’s understood Shiels, who was brought to the club by his father, Kenny on a one-and-a-half year deal last June, has been in ongoing discussions with Coleraine about a move to the Showgrounds. The ex-Rangers and Kilmarnock midfielder scored twice in 15 appearances in all competitions for Derry last season. 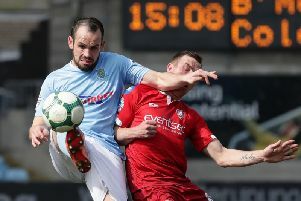 It was his second spell in the League of Ireland having won the 2016 Airtricity Premier Division with Dundalk where he made 16 appearances and scored four goals for the Lilywhites. Meanwhile, Devine admits he’s far from finished in terms of recruitment and expects several new arrivals in the coming weeks. The Brandywell boss has held talks with transfer-listed Coleraine winger, Darren McCauley but isn’t overly confident the club can compete with the financial muscle of other interested clubs, including big-spending Larne who are understood to have offered the Top of the Hill man a contract. Institute striker, Michael McCrudden also remains on Devine’s radar and he’s hoping the two clubs can reach an agreement soon.